I took another step to make the pork chops taste smoother with better sweetness, I used rock sugar. It gives nice shiny dark color coating to the chops, this makes the chops look more appealing and taste even better. 1) Place pork chops in a large bowl and season well with light soy sauce and Lea & Perrins’ sauce, for 10 minutes. 2) In a bowl, mix all tomato sauce, Lea & Perrins sauce and water. Stir well. Set aside. 3) Heat oil in a skillet over medium fire, pan fry the pork chops for 5 min each side, or until tenderly cooked. Transfer the chops and set aside. 4) Heat up a wok with low fire, add rock sugar. Stir constantly until dissolved into thick liquid. Add the cooked pork chops and coat well with the dissolved rock sugar. 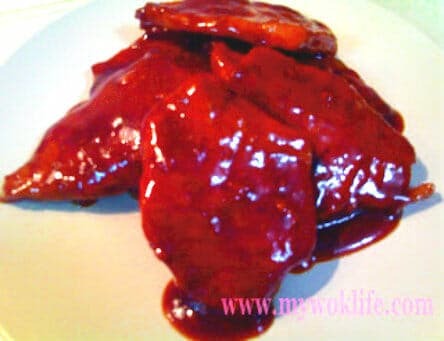 5) Pour the sauce and mix well with the chops. Stir fry for 3 min. Served. Calories of 1 slice of sweet and savoury pork chop counts about 200kcal. Tips: The chops should be coated well with the rock sugar. Do not be alarmed by the possible change of color of the rock sugar to dark brown, when it dissolved. *If you prefer sweeter taste, add sugar (about 2 more tablespoon) into the sauce mixture.